A good dark beer is used to cook the brats as well as to serve for a base for a delicious beer sauce. Bratwurst in Germany is street food, party and holiday celebration food. Paired with bold dark beer and some "Um Pah" music you can dance your little Lederhosen off all through the night. 1. Poke a few holes in each bratwurst with a fork so they don't burst. 4. Dredge the brats in flour. 5. Melt the butter in a skillet and fry the bratwursts on both sides until they are browned. 6. Remove them from the skillet and set aside. the yummy "GOODIES"** sticking to the sides and bottom of the pan. 8. Add the ginger cookie crumbs and grated onion. 9. Cook those together for about 10 minutes to reduce to a thick but runny sauce. 10. Season with salt, pepper, beef stock and lemon juice. 11. Cook for 2 more minutes. 12. Reduce heat, return the bratwurst to the skillet and cook them until heated through. 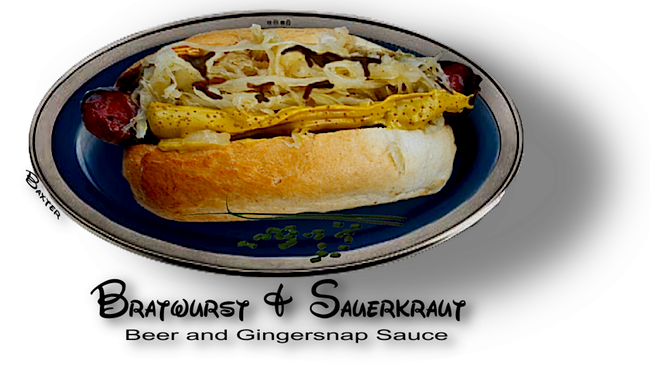 sauerkraut,  a little more sauce and serve with your favorite dark beer. add an extra measure of flavor to your sauce,  as well as making clean-up easier for your frying pan.